The Forest City dam on East Grand Lake. The dam's owner Woodland Pulp LLC. filed papers to surrender it's license to operate the dam and decommission the project. The decommissioning of the project could possibly result in the permanent drop in water level of East Grand Lake. 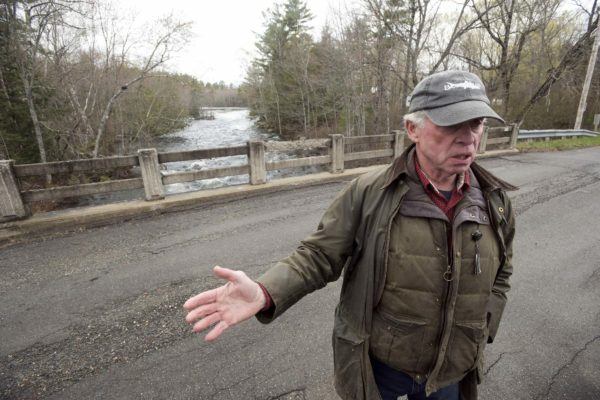 Dale Wheaton, former owner of Wheaton's Lodge in Forest City, Maine, on the bridge over the Forest City Stream at the border crossing between the United States and Canada. The owner of the Forest City dam, Woodland Pulp LLC., filed papers to surrender it's license to operate the dam and decommission the project. Forest City Stream at the outflow of the Forest City dam on East Grand Lake. The dam's owner Woodland Pulp LLC. filed papers to surrender it's license to operate the dam and decommission the project. The decommissioning of the project could possibly result in the permanent drop in water level of East Grand Lake. 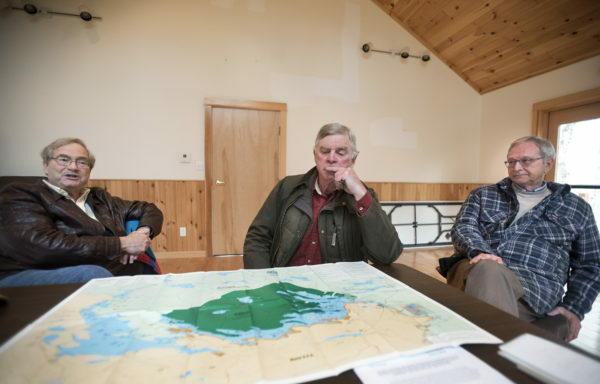 David Townsend, cottage owner in Forest City, New Brunswick (from left), Dale Wheaton, former owner of Wheaton's Lodge in Forest City, Maine, and Blaine Higgs, member of New Brunswick legislature who owns a cottage in Forest City, New Brunswick, talk about concerns surrounding the dam on East Grand Lake. FOREST CITY, Maine — The dam in this tiny border town isn’t much to look at: It sports three gates and a fishway, and may stretch all of 40 feet from Canada to the United States. 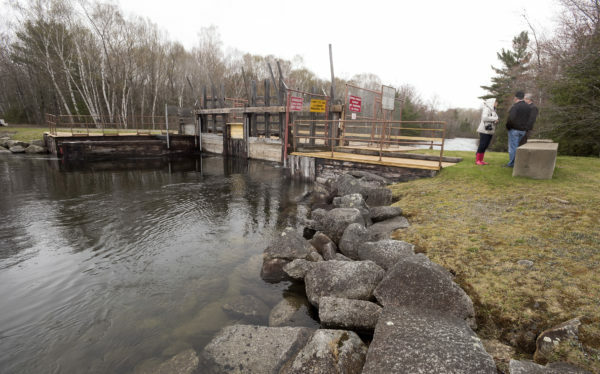 But a long-simmering situation has heated up in recent months as the mill owner, Woodland Pulp LLC, has filed paperwork with the Federal Energy Regulatory Commission that would allow it to surrender its license to the dam and remove two of the three gates. Look upstream from the dam, and you begin to see why that possibility troubles local landowners: There lies East Grand Lake, a massive, 16,000-acre impoundment that ranks among the state’s most popular fishing destinations. Around the lake are more than 2,000 camps and cottages. And downstream of the dam are other streams and lakes that could lose any sense of flood protection that they now have, thanks to the dam at Forest City. It’s a way of life, and the lifeblood of a region that depends on the interconnecting Chiputneticook chain of lakes, which includes East Grand, for both jobs and recreation. When Wheaton was growing up, Forest City was Forest City, whether you were talking about the town in Maine or the one in Canada. People crossed the border at will. One side had the church. The other side held the cemetery. And on lazy summer days, Wheaton said he’d often go to the Forest City Dam, which holds back massive East Grand Lake, one of the state’s more popular fishing waters. On that dam was a diving board. The truly adventurous took swimming off the dam to lengths that sound incredibly risky today. Now, that dam’s future — and the future of the lake upstream from it — hang in the balance. There’s been a dam at Forest City since about 1840, and the current dam has been in place since 1965, according to Wheaton. It’s not a power-producing facility, but it does serve to regulate the level of water on East Grand, and to determine the amount of water that is allowed to continue downstream. Power generation takes place more than 60 miles downstream, at Grand Falls in Baileyville. 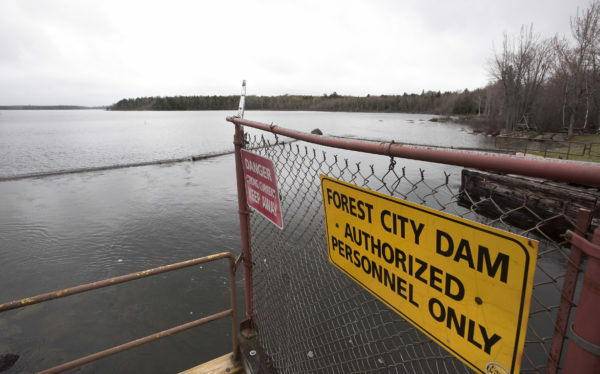 But because a portion of the water that flows through the dam is used for hydropower — and because of a decision made by the previous owner of the Woodland Pulp mill years ago — the Forest City Mill falls under FERC oversight. “Georgia Pacific at the time believed it was a wise decision to license previously unlicensed projects to make sure that ownership wasn’t taken away from them by others, which was happening back then to others in the state,” said Scott Beal, Woodland Pulp’s environmental manager. 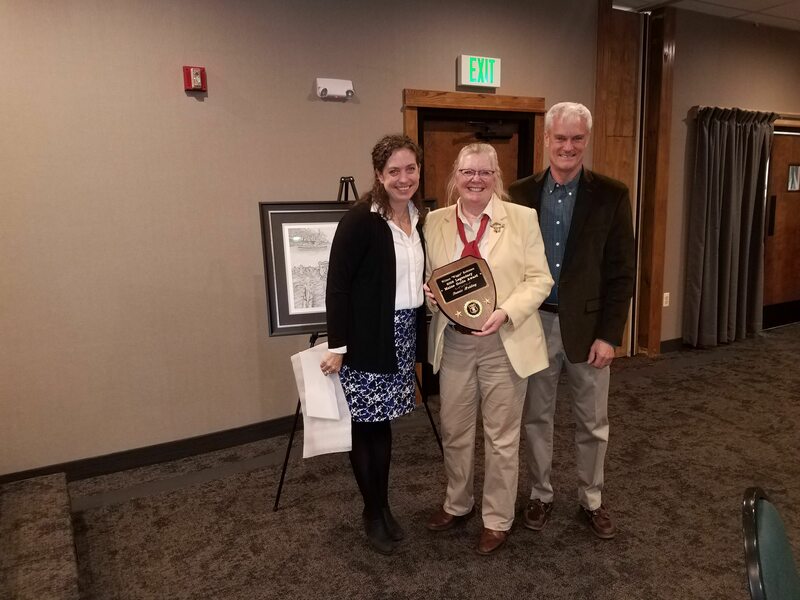 Beal has worked for Woodland pulp and its predecessors — Domtar and Georgia Pacific — since 1980. And he says relicensing the company’s dams through FERC has an interesting history. The relicensing of the Forest City Dam, for instance, began back in the mid-1990s, according to Beal. A 20-year license for Forest City and another at West Grand Lake expired in 2000, and during that licensing process, the company tried to get out from under the FERC regulatory umbrella. A variety of other agencies have some watchdog or regulatory power over the dams, according to Beal. Among those, the International Joint Commission, the Maine Department of Environmental Protection, and the U.S. Fish and Wildlife Service. The problem: FERC licenses are expensive in the long-term, as different requirements are typically added on, requiring the dam owner to fulfill recreational or habitat-related work in order to hold the license. According to Woodland Pulp, actually managing and maintaining the dam, in addition to fulfilling FERC requirements, will cost the company $6 million more than it will realize through the generation of power over the 30 years of the dam’s current license, which was granted in November 2015. That’s why, in December of 2016, the company took the bold step of asking FERC if it could surrender its dam license for the Forest City Project. “[The latest FERC license requirements have taken] a bad situation and really made it more of a concern from an economic standpoint, where we’ve had to make a business decision,” Beal said. Wheaton, who is also a former economics professor at UMaine, understands Woodland Pulp’s dilemma. “[FERC] has imposed a whole regimen of regulations and directives and orders on this company that doesn’t particularly need it,” Wheaton said. On East Grand Lake, lake dwellers are uneasy, but are taking action. The Chiputneticook Lakes International Conservancy, with its president David Townsend serving as legal advisor, has filed a motion to intervene and protest Woodland Pulp’s application to surrender the dam license. 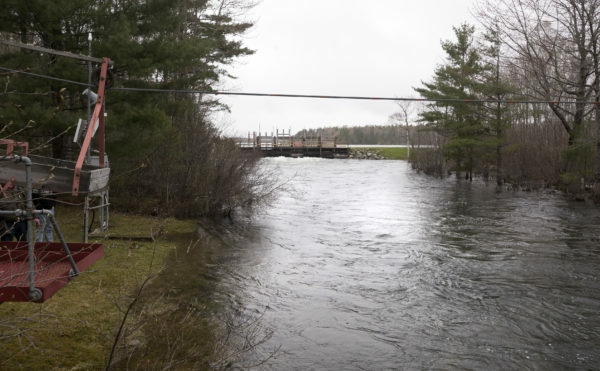 Townsend, who has a cottage in Forest City, New Brunswick, said it’s crucial that the Forest City Dam gates remain functional, so that water levels can be manipulated. The dam allows the water level in East Grand to be manipulated according to predetermined schedules, with flexibility for extreme weather conditions. For instance, levels are changed to accommodate various species of fish during spawning seasons, and to prepare for annual spring runoff. Minimum flow regimes are set for the stream that runs out of East Grand in order to avoid dewatering crucial habitat. Without those gates, or with the gates “frozen” at a specific level, that flexibility would be lost. And that newly exposed land wouldn’t be owned by a cottage owner who now finds him or herself farther from the water. Beal said Woodland Pulp approached Rep. Bruce Poliquin last summer and sought his help on a legislation that would allow the company to operate its mills without FERC regulation. That legislation didn’t move forward, which prompted the decision to take what Beal described as “a blunt force instrument” approach to the problem the company faced. What’s the best solution? Blaine Higgs, a New Brunswick legislator with a cottage on East Grand has one idea. Beal said Higgs’s assessment on the possible Woodland role was accurate. Wheaton also said getting FERC out of the equation was the key. “The best, logical, simplest solution to me is simply for FERC to go away, to have Woodland Pulp continue to operate and manage the dam and own it under International Joint Commission rules instead [of FERC] rules,” Wheaton said. A 30-day comment period on Woodland Pulp’s attempt to surrender the dams has recently expired, and Beal said he’s not hopeful that FERC will simply relinquish its role in regulating the dam. He said back in the mid-1990s, FERC made a decision to do just that in regard to the Forest City Dam, but changed its collective mind a year later. Beal wants to make it clear that Woodland Pulp doesn’t want to see the gates pulled from the dam, and for the impoundment be dewatered. He also wants people to know that simply fixing the gates at a given level isn’t a viable option, though some people have suggested it. And he says he’s hopeful that an agreement with a new dam owner might be forthcoming. Wheaton suggested in his interview that a private dam owner wouldn’t likely have to jump through the regulatory hoops that a corporate owner with power generation facilities does.